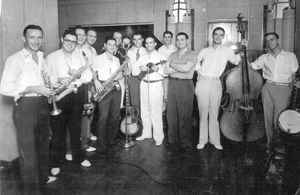 Western swing band founded in 1934 by Bob Wills after leaving The Light Crust Doughboys, active until 1965, reuniting with an ailing Wills in 1973. After the initial breakup in 1965, the band continued performing breifly "The Texas Playboys", reuniting again as The Original Texas Playboys Under The Direction Of Leon McAuliffe from 1973-1986. Inducted into the Country Music Hall of Fame in 1968, and into the Rock And Roll Hall of Fame (as "Early Influence") in 1999.